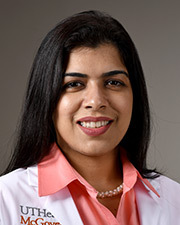 Sadia A. Durrani, MD, assistant professor at McGovern Medical School at UTHealth, believes in providing culturally competent, compassionate care for her patients. Her treatment plans are tailored to the needs of individual patients and are based on the principals of evidenced-based medicine. She treats primarily teens, adults and seniors. Dr. Durrani listens closely to each patient and strives for an open line of communication. With an empathetic and respectful ear, her style of practicing medicine invites women to be proactively involved in their care. Before joining McGovern Medical School, Dr. Durrani was an assistant professor at Rutgers New Jersey Medical School and also practiced women’s health care at Trinitas Regional Medical Center in New Jersey. She also enjoys teaching the next generation of physicians, and participates at community health fairs and speaking events. In her spare time, she enjoys exploring Sugar Land with her husband and three children.